Bishop Hendricken and Bishop Feehan won the elite races of the 46th annual Knights of Columbus 4 x 1 Mile Relays on Saturday. Thanks to a blistering 4:23 anchor leg by senior Colin Tierney, Hendricken took the Division I boys' race with a time of 18 minutes, 22.87 seconds. La Salle Academy was second at 18:25.96. Barrington copped the Div. II race with a time of 20:11.90 and East Greenwich was a winner in Div. III at 18:40.87, the third fastest clocking of the afternoon. 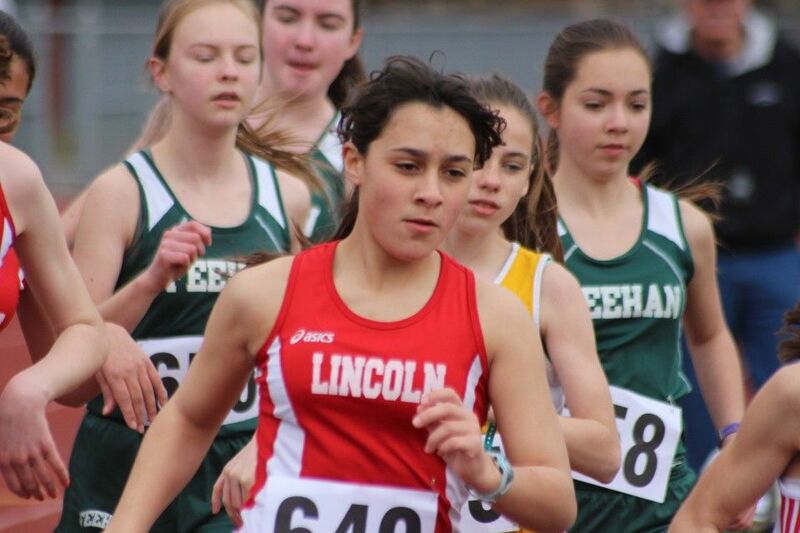 Cumberland resident Abby McNulty anchored a Feehan squad that earned gold in the girls' Div. I race in 21:30.14, the second fastest time in meet history. La Salle was the runner-up at 21:30.14. In Div. II, East Greenwich took the prize with a time of 23:15.65. In the freshmen mile, Sophie White of Portsmouth was first for girls in 5:36.84. Barrington's Mars Bishop copped the boys' race with a time of 4:53.49. The meet, which was held at Mount Pleasant, also includes a hammer conpetition. Moses Brown's Owen Russell placed first for boys with a major PR of 209 feet, 5 inches. Barrington's Bobby Colantonio was second with a heave of 199-11. Leia Mistowski of Narragansett won the girls' hammer with a toss of 167-10. For photos of the K of C meet, click here. Coming soon we'll have stories and complete results of the day's events. HT - (9 kilo) 1, Leia Mistowski, Narr. 167-10 (51.16 meters); 2, Alva Hicks, Class. 156-9 (48.62); 3, Tori Ebert, EWG 151-0 (46.02); 4, Bianca Donadio, Class. 146-0 (44.75); 5, Lauren Swanson, EG 140-4 (42.77); 6, Megan Malloy, Smith. 136-3 (41.52); 7, Lysah Russell, Class. 131-6 (40.08); 8, Tara Rochefort, Woons. 131-4 (40.03); 9, Madison Caron, Pil. 131-1 (39.95). HT - (3 kilo) - Hicks 180-7 (55.05); 2, Malloy 159-7 (48.65); 3, Swanson 158-5 (48.30); 4, Rochefort 147-5 (44.95); 5, Russell 133-3 (40.62); 6, Carly Timpson, Narr. 124-1 (37.83). Freshman mile - 1, Sophia White, Ports. 5:36.84; 2, Abby Long, Feehan 5:55.24; 3, Bryana Mullin, Pil. 5:55.71; 4, C. Vogel, Feehan 5:56.14; 5, Sydney Bagus, Smith. 5:56.78; 6, R. Rodiquez, Feehan 5:58.40; 7, Ailsa Ferland, Linc. 6:06.93; 8, Maranda Duffie, Pil. 6:15.71; 9, Samantha Leal, Linc. 6:16.55 ; 10, Allison Leal, Linc. 6:50.90. 4x1-mile (Div. I) - 1, Feehan 21:30.14; 2, La Salle 21:46.18; 3, Feehan “B” 22:41.20; 4, La Salle “B” 23:34.34; 5, Feehan “C” 23:55.08; 6, La Salle “C” 24.41.66; 7, La Salle “D” 25:33.65; 8, La Salle “E” 26:08.68; 9, La Salle “F” 27:05.71; 10, Mt. Pleasant 33:54.65. 4x1-mile (Div. II) - 1, E. Greenwich (Pedersen, Osterhout, Browne, Mc Caffrey) 23:15.65; 2, Holyoke 24:13.96; 3, Prout “B” 24:29.52; 4, Narragansett 25:54.81; 5, Pilgrim 26:06.24. HT - 1, Owen Russell, MB 209-5 (63.83 meters); 2, Bob Colantonio, Barr. 199-11 (60.93); 3, Tom Vadis, Class. 198-11 (60.62); 4, G. Arcaro, Mass. 196-0 (59.74); 5, Connor Fugere, Woons. 190-10 (58.16); 6, Giovanni Gray, Linc. 176-6 (53.80); 7, Meta Francy, MP 172-11 (52.70); 8, Mike Alvernaz, Barr. 167-4 (51.00); 9, Stafan Balestra, Linc. 166-0 (50.60); 10, Alex Cerbo, BH 164-2 (50.04). Freshman mile - 1, Mars Bishop, Barr. 4:53.49; 2, Hank Perretta, EG 5:05.62; 3, J. Turk, St. John 5:07.18; 4, Jack Cronin, EG 5:09.21; 5, Max Waite, BH 5:14.34; 6, Dan Ruggerio, BH 5:17.65; 7, Rob Merlino, BH 5:19.55; 8, Jakob Morris, Linc. 5:19.99; 9, Nate Coogan, NP 5:20.40; 10, Liam Carberry, Narr. 5:22.58. 4x1-mile - 1, Hendricken (Tierney, Potter, Ingegneri, Gauthier) 18:22.87; 2, La Salle “A” 18:25.96; 3, St. John 18:53.24; 4, Cumberland 18:59.65; 5, Hendricken “B” 19:29.05; 6, BC High 19:37.78; 7, Hendricken “C” 20:01.62; 8, La Salle “B” 20:08.43; 9, BC High “B” 20:16.05; 10, Cumberland “B” 20:49.11. 4x1-mile ( Div. II) - 1, Barrington (Bledsoe, Boniaz, Safrenek, Somera) 20:11.90; 2, W. Warwick 21:41.52; 3, Mt. Hope 21:56.05; 4, Pilgrim 22:09.24; 5, Hope 22:29.55; 6, Lincoln 22:39.58. 4x1-mile (Div. III) - 1, E. Greenwich (Scanlon, Sommer, Acker, Chapski) 18:40.87; 2, Feehan 19:09.55; 3, E. Greenwich 20:31.18; 4, Portsmouth 20:32.21; 5, Feehan “B” 20:37.55; 6, Prout 20:38.68; 7, Feehan “C” 21:47.40; 8, Central Falls 21:5 3.24. Special Olympics relay - 1, Birch Vocational (David Cruz, Fremy Reyes, Jermaine Robertson, Aldo Faustino) 6:38.5.